Advanced IP Scanner is a free network scanner used to analyse LAN (Local Area Network). This application scans your Network and shows all the connected Network devices. It also allows you to remotely access the connect Network devices through RDP or Radmin. Advanced IP Scanner also allows you to shut down the connected network computers as well. If you are planning to download a IP scanner within your local network, then this free Advanced IP Scanner should be the first choice. It allows you to easily access your LAN devices. You can take remote control over other connected device through RDP or Radmin. MAC address of all the connected device is detected. You can shut down the computers remotely. The scanned results can be exported to a excel sheet. If you don’t wish to install, you can use it as a portable application as well. You may also like: How to cast IPTV on Chromecast? How to Download Advanced IP Scanner? 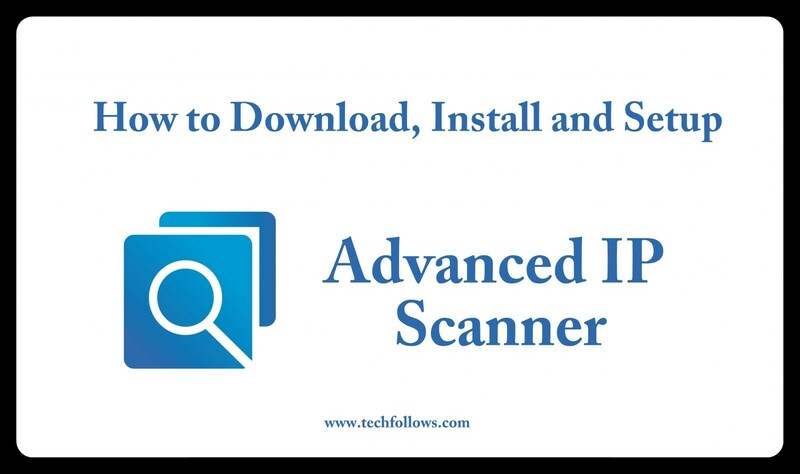 #1: Open the official website of Advanced IP Scanners or click here. #2: Click on the “Free Download” button. #3: The app will start downloading in a few mins. #4: Click on the downloaded file and start the setup process. How to Setup Advanced IP Scanner? #1: After opening the downloaded file, the setup file will open with “Select the Language” tab. #2: After selecting the language, It will prompt you to the installation page. You can either choose to install or you can run a portable version. We have chosen installation here. Select “Install” radio button and click “Next“. #3: You will get the “End User License Agreement“. Read and choose “I Accept the Agreement” and click “Install“. #5: Once installed, you can start running the application. #6: This is the homepage of this application. Click “Scan” to scan all the connected devices to this network. #7: The list will appear like this. You can right click on any device and try controlling it with the help of Radmin or RDP. These are the ways to setup Advanced IP Scanner on your computer. You many also like to install VPN in your device. Advanced IP Scanner is not available for Mac and Ubuntu OS, but there are many alternatives for IP scanner like Angry IP scanner and many more. These are the ways to download, install and setup IP scanner on your computer. By scanning the network, you will get the details of all the connected network devices. You can remotely access those devices by installing a Radmin or an RDP along with the free IP Scanner. Advanced IP Scanner is one of the best tools required for an office with LAN connectivity. Thank you for reading this post. Visit www.techfollows.com for more tech information. Leave your feedback and queries in the comment section below. How to Download and Install Plex for Android TV? NBC Sports on Kodi – How to Install NBC Sports Live Extra Kodi Addon? How to Download Your Facebook Data | Know What Facebook Has About You! MLB.TV Kodi Addon 2019 – How to Setup and Watch MLB on Kodi? How to Install DAZN Kodi Addon ? How to Install Sport365 Live Kodi Addon ? How to Install Cartoon Crazy Kodi Addon in 2019? How to Install Popcorn Time on Apple TV 4K,4,3&2?